If you’re experiencing issues with your gum health or you simply want to take preventative measures, then the Philips Sonicare AirFloss is something you should definitely invest your time and money on. If you’re anything like me and thousands of Brits out there, the thought of flossing most likely brings feelings of frustration and dread. Although flossing is one of my least favourite activities, I’ve recently come across a water flosser that cleans the hard to reach areas of my teeth and gums in just a matter of seconds. 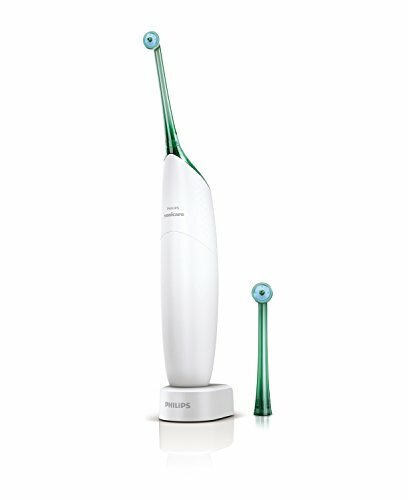 The name of this excellent product is the Philips Sonicare AirFloss Power Flosser. The Phillips Sonicare AirFloss Power Flosser comes with a number of features. It is an excellent complementary to traditional brushing and it improves gum health, tooth decay and bad breath by blasting out plaque and pieces of food between your teeth. By purchasing the Sonicare AirFloss you remove 99% more plaque on your teeth than traditional brushing. The AirFloss is also clinically tested and proven to improve gum health in just two weeks and it effectively prevents gum disease while gently stimulating gums and improving blood circulation. This excellent device uses a breakthrough microburst technology which uses a burst of pressurised air and water to deliver a deep cleaning between your teeth. Although the AirFloss is strong enough to clean hard to reach areas of your teeth, it’s also very gentle. In fact, 78% of volunteers that tested this product reported that they found this product far more gentle on their teeth than traditional flossing. Along with its functionality, the Sonicare AirFloss has an excellent battery life. With just one battery charge you get up to two weeks of uninterrupted use. In order to use the Sonicare AirFloss you simply have to follow three easy steps. First off, you fill up the reservoir with water or mouth wash, place the air floss tip up to one of the gaps of your teeth and either hold down the button for continuous bursts or press and release to set up the manual burst mode. Finally, begin cleaning each of the regions between your teeth. You will notice that all it takes is 30 seconds to clean your entire mouth. This model is also very light weight and has a shipping weight of just 340g. It cleans your teeth in only 30 seconds. It cleans up to 5 times more plaque than regular flossing. It has a 2 week battery life. After 4 minutes, it automatically shuts off. The reservoir size is a bit small and may need to be refilled before finishing your cleaning session. It only comes with one pressure setting which might be too strong for people with sensitive teeth. When buying Philips products, you are ensured quality. The AirFloss delivers professional grade performance which will help prevent and even improve your overall dental health. Another thing to keep in mind is that, the pressure delivered by this model is somewhat strong. Although children (8 and up) and adults can use the AirFloss, it’s recommended that you you place the nozzle about 5-6mm away from your teeth while using it. Flossing can be an uncomfortable and sometimes painful experience. Although flossing can prevent gingivitis and other gum infections, once these conditions have already developed, flossing can actually cause bleeding and even complicate things even further. If you want to improve your tooth and gum health without the hassle of flossing, the Sonicare AirFloss can help you do just that. Before using this product I had some occasional bleeding in my back molars with some irritation and swelling in my gums. After just two weeks of using this product, the bleeding and swelling completely subsided. By purchasing the AirFloss, I feel that I was able to take matters into my own hands and save myself several visits to the dentist. If you’re experiencing issues with your gum health or you simply want to take preventative measures, then the Sonicare AirFloss is something you should definitely invest your time and money on. Now it’s time to hear about you. Have you personally used this product? If so, how was your experience and what improvements in your oral health have you noticed?